Trailblazing postmodernist architect Michael Graves, designer of the controversial Portland Building, died on March 12 at 80. This story from our archives examines how the Portland Building, Graves's most notorious project, came to be. Every weekday, City of Portland employees squint through the three-foot-by-three-foot windows of the Portland Building—some, no doubt, cursing the fact that the 364,000-square-foot warren of bureaucratic offices was ever built. Complaints about the building are legion: terrible lighting, substandard ventilation, leaks everywhere. It needs about $58 million in repairs. But when it rose in 1982, many hailed SW Fifth Avenue’s Portland Building as a breakthrough: the nation’s first major work of postmodern architecture, a departure from the glass-and-steel towers of midcentury America. 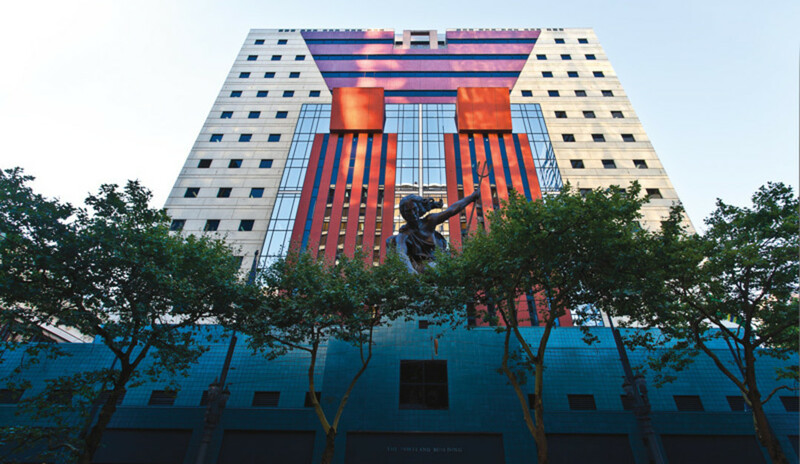 (And that was before Portlandia, the iconic Raymond Kaskey sculpture, adorned the façade.) How did something so right go so wrong? The tale traces back to a quintet of alpha males who each wanted something a little different. Neil Goldschmidt: Elected in 1972 as one of the youngest mayors of a major American city, by the mid-‘70s Goldschmidt was attracting national renown. To punctuate his signature revitalization of central Portland, he craved a public architectural wonder. Edward Wundram: Wundram thought the city should shun local architects like himself and seek a national visionary. At a dinner party, he asked Graves if he could be lured into a competition. (Graves: “Just ask.”) He then unwittingly recommended Graves’s mentor, Philip Johnson, as the competition’s chief juror. Johnson, one-time curator at NYC’s Museum of Modern Art, was arguably the century’s most influential architectural tastemaker. (The Oregonian noted that some called him the “guru” of postmodernism.) Johnson favored his protégé’s neoclassical temple over competing modernists. This old-boys'-club city commissioner took charge of financing the project after Goldschmidt left city hall. Ivancie essentially set the budget at 10 percent below the cost of a common office building—ensuring that design aficionados and city workers alike would bemoan the final product.